fixed video sender cannot display correctly on windows 10.
fixed video receiver cannot display correctly on windows 10.
fixed video receiver cannot double click to maximum the video window and cannot use right click to mute the video window on windows 10.
fixed VideoWindowAspectRatio property in video receiver cannot set aspect ratio in windows 10.
fixed when close the form, the project have not stop issue in VB.NET 2010, VB.NET 2015, C# 2010, C# 2015 client sample. added C# 2015 WPF Video Sender, WPF Video Receiver samples. fixed change videoformat property does not work on video sender. added support add chat message in real time or add scrolling chat message in real time (need purchased Chat Banner plugin). added support change the font name, font size, font style of chat message in real time. added support select direction (up, down, left, right ) of scrolling chat message. added support change the position of chat message in real time. fixed video receiver \'s flicking issue when video is maximized and another people enter the Conference Room. added ChatBannerAddText, ChatBannerBgColor, ChatBannerDirection, ChatBannerFadeEdge,ChatBannerFillBgColor, ChatBannerPos, ChatBannerSetFont, ChatBannnerSpeed, ChatBannnerState, ChatBannerTextColor methods. updated VB6, VC , VB.NET 2010, C# 2010 samples. 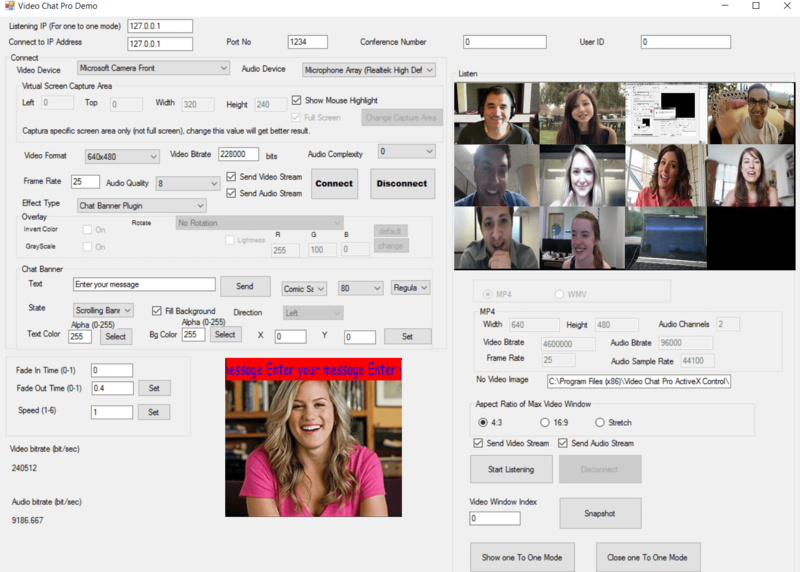 added support Rotate, horizontal flip, vertical flip the video, add Invert Color, Grayscale, Lightness effect when video chat. added Rotate, InvertColor, Grayscale, Lightness methods. added UseDefaultVMR property in video sender and video receiver. fixed black screen issue when preview from video sender and received the video from video receiver. fixed support Microsoft Camera Rear. fixed cannot display video with high DPI. fixed capture to MP4 video without audio issue. 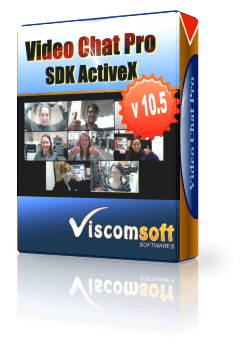 updated VC , VB.NET 2010, 2015, C# 2010, 2015 one to one video chat sample. added OnNewUserConnection, OnUserConnectionLost events in Video Chat Pro Receiver. added allow set the webcam resolution to 1280x720. added allow control the 4:3, 16:9 or stretch mode of receiver video window when maximize mode. added allow Programmatically show the specific index of receiver video window to maximize mode. added allow Programmatically close the receiver video window when maximize mode. 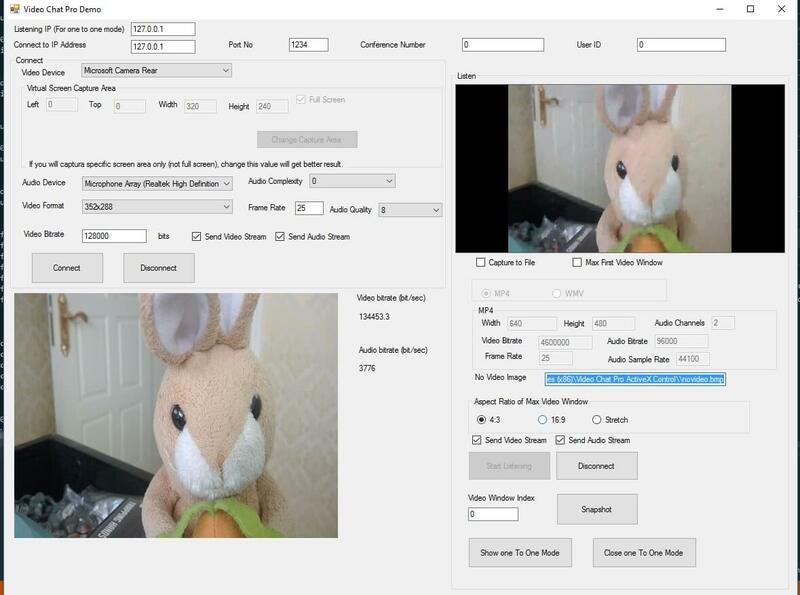 added allow capture to MP4 videos of receiver video windows. fixed Video Chat Pro server will crash on VB6 when builded to exe and the client connected. added VirtualScreenCursorFile, VirtualScreenShowSystemCursor, VirtualScreenRightClickColor, VirtualScreenLeftClickColor, VirtualScreenHighlightColor, VirtualScreenCaptureFullScreen methods in sender activex. added VideoWindowAspectRatio, MP4Width, MP4Height, MP4Videobitrate, MP4Title,, MP4Copyright, MP4Comment, MP4Author, MP4Audiochannel, MP4Audiobitrate, MP4AudioSamplerate, MP4Album, MP4FrameRate, CaptureFileType properties on receiver activex. added ShowOneToOneMode, CloseOneToOneMode method on receiver activex. updated VB6, VC , VB.NET 2010, C# 2010, Delphi sample. added allow set the capture area when using Virtual Screen Capture. updated VB, VB.Net 2010 , C# 2010, Web page samples. fixed VC exe sample cannot close issue. added How Can Video Chat or Screen Sharing with Internet Explorer (IE) articles in help file. added VirtualScreenCaptureArea and VirtualScreenVideoFormat methods. digitial signed Virtual Screen Capture Driver. 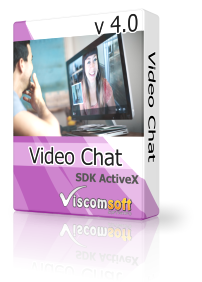 improved VideoChat Sender support Virtual Screen Capture filter. 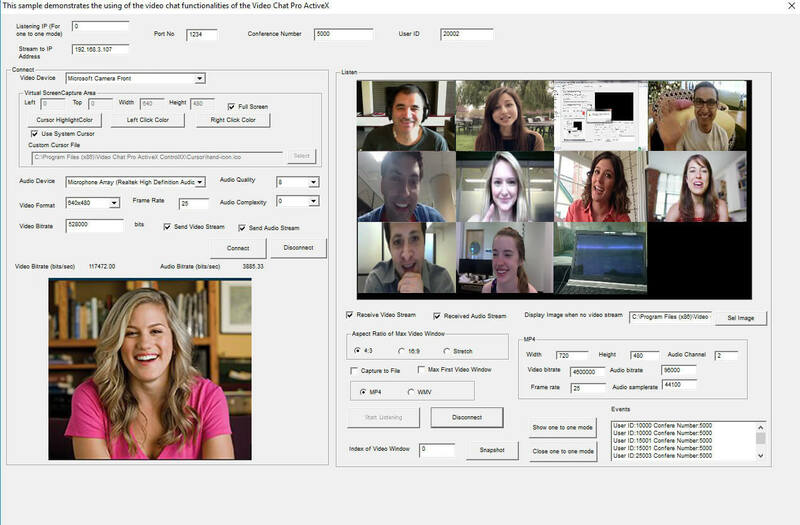 redesigned video chat engine. Now it support one to many , one to one video or audio chat and control the audio and video quality when video chatting. added support almost all web cam in 32 bit OS and 64 bit OS. added vb.net 2010 and c# 2010 samples and fixed cannot run on 64 bit OS issue. fixed cannot connected some web cam issue. added VideoDevice and AudioDevice properties , now it can selected the audio/video device by index. remove SelVideoDeviceName and SelAudioDeviceName properties. added allow popup the receiver video window, change the video position, topmost window style. added GetIPAddress, ReceiverVideoWndCaption, ReceiverVideoWndPopUp, ReceiverVideoWndOwner,ReceiverVideoWndPos, ReceiverVideoWndStyle methods. support more web cams now.